How about this for a speedy flash pasta dinner. This creamy mushroom sauce is perfect and delicious on toast or pasta. Here I have added to spaghetti with a sirrachi “chilli sauce” for an added bit of heat and buzz finished off with a drizzle of truffle oil. It’s so good, so simple and smells awesome. 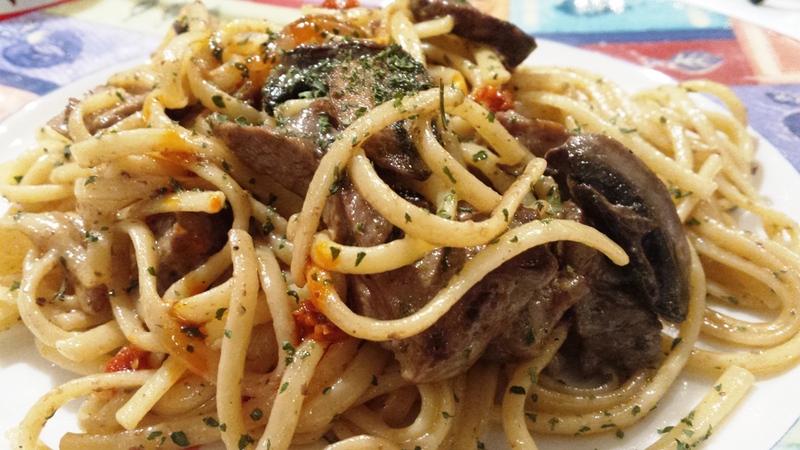 For a meat free/vegetarian option you can simply make a creamy mushroom sauce…Creamy mushroom spaghetti. Flash cook the meat slices, season with a little salt and pepper. Once cooked remove and put in a plate. In the same pan add the mushroom and a good pinch of salt and pepper. Add the chopped spring onion, cooked meat, taste for seasoning then pour in the cream. Continue to stir and cook for another minute, until the cream has come to the boil, then turn down the heat and simmer for a minute before removing from the heat. Serve with a drizzle of olive oil or truffle oil. Enjoy.